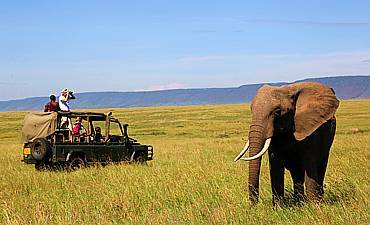 Want A Balloon Safari In Masai Mara? Scroll Down For Details.. Hot air balloon rides are exhilarating in any setting. 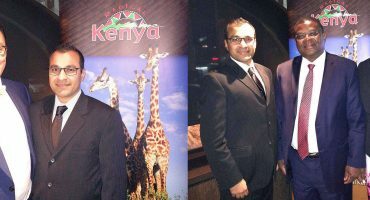 A hot air balloon safari over Masai Mara National Reserve, though, is a once-in-a-lifetime experience. 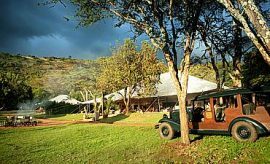 We highly recommend that adventurous guests plan to stay at the reserve for at least three days to allow time for this activity along with your other safari activities such game drives, bush walks, village visits and more. Additionally, hot air balloon flights need to be pre-arranged by your AfricanMecca trip representative to ensure guaranteed availability due to the limited space of only 16 passengers in a balloon. The balloons can accommodate adults and children, with some limitations. Children must be at least four years old and must be accommodation by a parent or guardian. We recommend that adults be in good physical condition. Adults who are over 265 lbs (120 kg) may be required to purchase an additional spot on the balloon (twice the cost) for safety precautions, though this can be waived depending on flight occupancy at the discretion and prior approval from the pilot. For our guests who have not been on a hot air ballooning excursion in Africa or elsewhere, we offer some general information about how a hot air balloon works and what to expect. Typically, staff of 20-25 people are required for the launch and recovery. When you arrive at the launch site, you may have a chance to see the balloon, also known as an “envelope,” being inflated. The ground crew opens the envelope by laying it across the ground. A large fan is used to inflate the envelope partially. When the envelope is about half-full, the crew attaches the basket and burner. The basket remains fully secured to the ground during inflation. The burner is used to inflate the envelope fully. Watching the inflation and preparation is an incredible experience, as you soon see the truly massive size of the balloon. Once the balloon is fully inflated, the crew helps passengers aboard. The basket of your balloon is sectioned into multiple compartments for both your comfort and safety. The ground crew steadies the balloon as your pilot gives you and other guests a safety overview. When everyone is set, the burner is turned on once again, and you feel the balloon aloft the ground. The crew guides the basket until the balloon is safely launched. No two hot air balloon safaris are the same. The balloons rely on air currents, such as wind direction and speed. The pilot only controls the up and down movement. 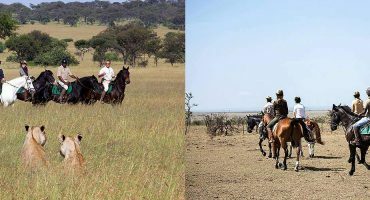 This is why hot air balloons require a chase team, and why you will have a unique and exclusive tour of Masai Mara National Reserve during each hot air balloon safari! Best of all, hot air balloons fly over areas of the reserve that are restricted to safari vehicles! During your flight, even the altitude of your balloon flight is different – sometimes, you rise high above the plains so you can see for miles while at other times, you remain closer to earth, giving you close-up views of the animals. 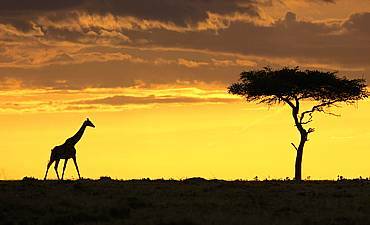 AfricanMecca Safaris can arrange hot air ballooning in Masai Mara for all guests staying either in the reserve or in private conservancies; though, pickup times do vary depending on the distance from the launch site. 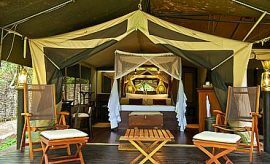 Private hot air balloon safaris can also be arranged for multi-generation families and small groups during their bush holiday, and a discounted rate may be available depending on your month of travel. The day of your hot air balloon safari with AfricanMecca begins before dawn. 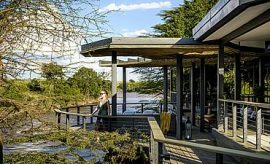 You awaken to the quiet sounds of the East African bush – soft calls of indigenous birds, rustling vegetation signaling the presence of a large mammal, low snorts and grunts of hippos returning to the river and may be a distant roar of a lion. 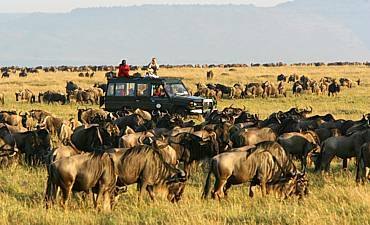 Your memories are filled with images of the prior day’s game drive through Masai Mara National Reserve (read more on when is the best time to travel). Your curiosity is piqued as to the wonder and amazement you are sure to feel as you drift above the savannah plains in a hot air balloon. 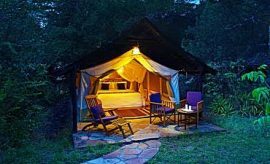 A soft voice outside your tent pulls you back to reality, and you hurriedly dress in your favorite Kenya safari attire. You are sure that the air will be cool, so you don long trousers and a comfortable shirt before putting on your hiking shoes. As you head out, you grab the last of your belongings – a hat, long-sleeved jacket or warm fleece, camera and binoculars. A member of the ground crew awaits you by the 4x4 vehicle. You climb aboard and head out across the open plains. The pre-dawn hour gives you an interesting insight into animal behavior. Hyenas gather around the remains of a lion kill, a young elephant playfully chases various birds and a gazelle springs amongst the grasses. Ahead you see some of the launch staff where the massive balloon is partially inflated and billows in the gentle morning breeze. You watch intently as the crew attaches the basket and burner. Suddenly, an orange flame illuminates the setting, creating an almost artistic contrast with the soft pastel colors of the dawn sky. After a few minutes, you climb into the basket. Anticipation grows as you await the launch. The ground crew skillfully steadies the balloon as the pilot lights the burner consistently. You feel a strange sensation in your stomach as you see the ground slip away. You look across the landscape, seeing what you imagine being the farthest edges of the terrain. 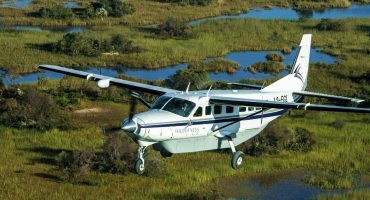 As you ascend aerially, beautiful features unfold before your eyes – gentle rolling hills, meandering rivers and lush grasslands. 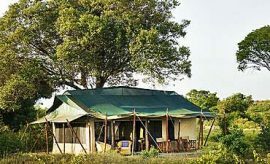 From this vantage point, you realize that you can locate wildlife with little guidance – giraffes, elephants, gazelles, hippos and many other grazers and foragers. 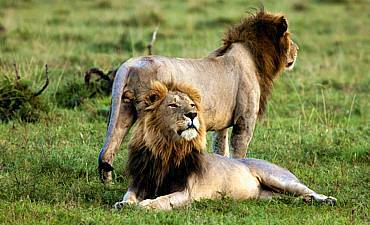 If you are lucky, you may even spot the lordly predators like lions, hyenas, cheetahs and other hunters. 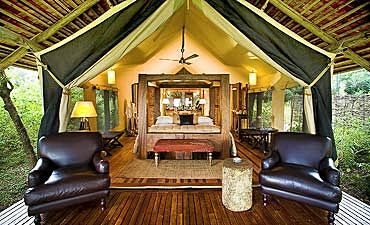 As you sail above the reserve, you gain a greater perspective and deeper appreciation for the intricacies of the Mara ecosystem, as well as the synergistic relationship between flora, fauna and human. You see how animals feed upon vegetation, moving when a new supply is needed. 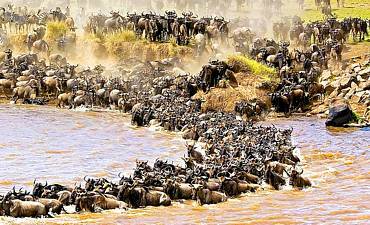 You watch herds move toward the water to drink and bathe. You watch as two elephant bulls fight for breeding rights. You notice how a cheetah mother gracefully moves through tall grasses to hunt food for her young. You observe a fish eagle soar in the open skies before diving to the river’s surface where it elegantly extracts a fish. 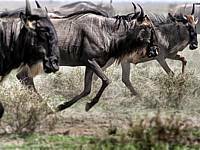 Should your personalized AfricanMecca travel to Masai Mara Reserve occur from July to October, you may also be enthralled by the Great Migration of enormous herds of wildebeests and zebras. Your hot air balloon ride lasts about one hour, but your experience lasts a lifetime and very much worth its high price. After landing, the ground crew helps you out of the basket and escorts you to a lovely setting for a bush breakfast. A customary champagne toast celebrates not only your experience, but also the incredible beauty that you discover during your superb dream vacation in Africa.